I wrote this song at some point in 2003, I wrote it for my wonderful wife, who really did turn my life around. My favorite line from the song is “I thought love was just a fairy-tale”, that is where I was before I met my wife. I toyed with waiting to record this song until I have learned a lot more about the process, maybe even got some better grade equipment. However I decided on recording it sooner rather than later, mainly because I have wanted to give this song to my wife in a recorded format for almost 10 years now. Hopefully the love invested in the song makes up for my short comings as a recording engineer (and singer). 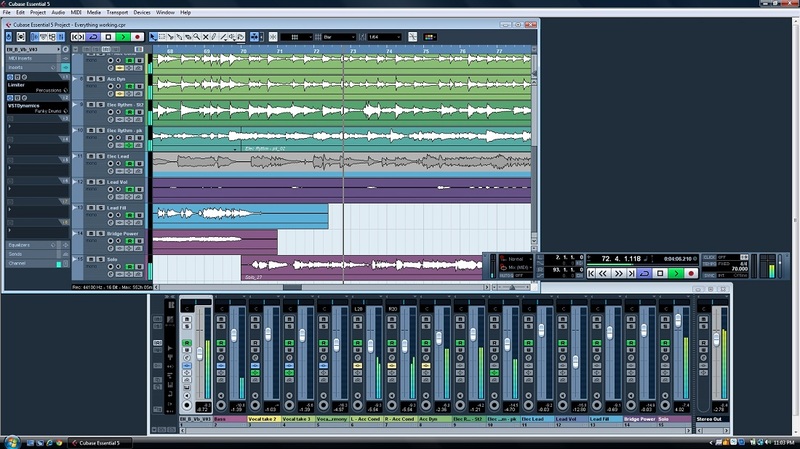 The (recording) learning process is still steep, if I’m not careful I can quickly & easily convince myself that it is my equipment’s fault that there is a harsh edge to the recording, or that the mix doesn’t quite sit right. 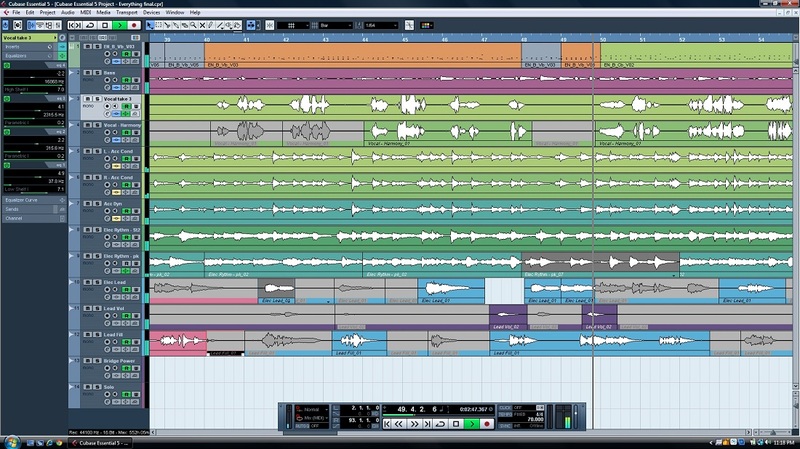 If I just had a really powerful PC & Pro-Tools, it would sound amazing. The unfortunate truth is that, while yes I could have better equipment, the biggest thing I can do to make my recordings sound better is really learn how to use what I have. There is no point expanding my tool chest a hundred fold if I am still working out what to do with the hammer. Having said that, I have learned a ton recording this song & am looking forward to making more progress on the next one. I am still hopelessly lost with EQ-ing, so much so that I only added it to the vocal tracks, and that what just twiddle & hope. Hopefully a frequency analyzer plugin that I got just tonight should help for my next project, being able to visually see what is happening with the track should make it easier to EQ. I was tempted to spend all week working through this mix to add EQ to every track & try to fine tune it, but I feel like it is at a closing point right now. Once I really know what I am doing I can come back to it if I really want to. There are other tools like compression & limiters that appear in all the research I have done & I have used (thanks to presets), yet while I get what they do, I am still uncertain of how to effectively use the settings. One of the things I did while recording was not to record parts & use the loop over but I recorded each track in its entirety, so the song is truly a performance. I am kind of proud of that, although it was stupidly time consuming & my next recording will probably include much more shortcuts. I also recorded a bunch of lead guitar parts over 4 tracks. It was great to have a lot to choose from, but the process of selecting what to use & where was laborious. I got the mix up to 22 tracks, the screen shot only shows 15, but when you drag the 8 track drums sequence from EZdrummer into Cubase Essentials, it puts the 8 tracks in as 1. Makes trying to mix the drums a really pain, but you work with what you have. Other than EQ-ing, the other main area of study I need to focus on is harmony, vocal harmony. I can (just about) sing a harmony part, but understanding where the harmony should be and what pitch should be etc is just not something I really understand yet. Part of me is tempted to just get a TC Helicon & forget about it, but I am going to at least try & learn. I might not have Dave Grohls talent or recording budget, but I share a lot of his views of keeping music as human as possible. Now the funny thing is, my next project is actually the same project. While I was getting ready to record this I came up with a completely new arrangement & style for the song, I almost went straight to that but wanted to do the original first which has a country feel that I enjoy a lot. Let’s see how long it takes me to get version 2 done, then you can compare let me know which you think works best.